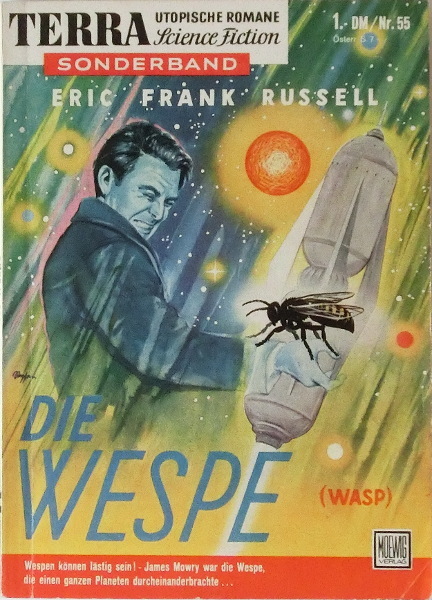 First edition ("Ein deutscher Erstdruck" stated on p. 2). Apparent first (and probably only) printing. The novel ends on page 91. Pages 92-95 list Moewigs purchasable Science Fiction digests. Page 96 and the back cover pages are filled with ads. Statement: TSB #56 is to be published in 4 weeks time. Date from announcements in the Terra series´and simultaneous publication with Terra #228 and Perry Rhodan #36. Cover artist's signature on cover: left side above title.